True confession: By late summer, I’m tired of cooking. It’s muggy hot and nothing seems appealing. However, since one cannot live by watermelon alone, I look for fun recipes to fix. While flipping through an older recipe file folder, I found my notes on making Mosaic Potatoes. As I recalled, I can serve the crisped potato slices as a side dish or appetizer. I purchased a small bag of newly dug potatoes from the Waleska Farmers’ Market and snipped a few flat leaf parsley leaves from the pot of parsley I keep growing on our porch deck. Then I called my friend, Cheramie Sonnier, food editor of The Advocate newspapers in Baton Rouge and New Orleans. “Do you remember Mosaic Potatoes?” I asked. “Yes, we first tasted them at an Association of Food Journalists conference in Napa Valley, Calif.,” Sonnier said. Sonnier found the recipe in The Advocate’s files and e-mailed me a copy. The version I later made is a little different, but not much. 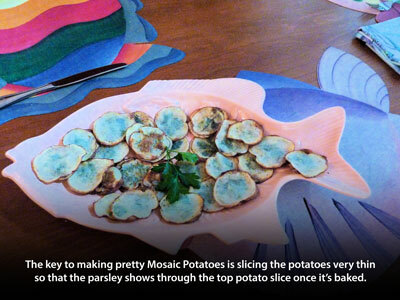 These are fun to prepare and eat and never fail to elicit compliments from guests because the parsley-embossed potato slices are pretty. Do try. Original recipe was from Laurie Souza of the Franciscan Oakville Estate Winery. A variation was also developed by David Burke of the Smith & Wolensky Restaurant Group. Slice potatoes into paper-thin slices. I use a mandoline for slicing so that the slices are uniform. Separate slices and place on a large cookie sheet that has been sprayed or coated with olive oil. Brush additional olive oil over surface of half the potato slices. 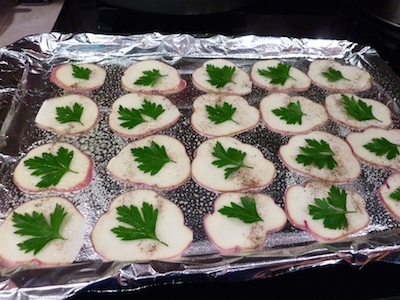 Arrange a parsley sprig on each oiled potato slice. Place a potato slice over the parsley and gently press together to remove air and slightly flatten the parsley. Drizzle a little olive oil over the potato stacks. Season with salt and pepper. Bake at 350 to 375 degrees (depending on your oven) for 5 minutes. Remove from oven and gently flip the potato stacks. Return to oven and continue baking until the potatoes are cooked through and lightly browned or crisped on the edges. Remove from oven and cool just enough for the pretty Mosaic Potatoes to be served as chips. Add additional salt and pepper, if needed.